Reading along in the book about the early Florida Keys (The Florida Keys, A History of the Pioneers by John Viele) my interest was piqued by a place called Garden Cove just at the northern end of today's John Pennekamp Coral Reef State Park and where the Overseas Highway (US 1) makes a sharp turn and heads south through Key Largo and on to Key West. The way Garden Cove got its name was very interesting. The reefs along the east coast of the keys were disastrous to ships who were unfamiliar with the area. Lots of shipwrecks brought about the big business of wrecking, the term in those days for salvaging from shipwrecks. The government decided to commission a floating lighthouse, a ship that would anchor on the reef and warn ships away with two lanterns and a bell. The first ship that was sent fell victim to "dry rot and fungus" and had to be replaced. The replacement was called the Florida and was made of rot resistant live oak. But that was not the only problem John Whalton, the captain of the ship would have to deal with. Supplies were not only hard to come by, they were very expensive so he had the crew go ashore and establish a vegetable garden on the shore. This is where Garden Cove got its name. Unfortunately it would eventually be the end of Whalton and one of his crew. There were several uprisings of the Seminole tribes in Florida in the mid 1800s and during the second Seminole War, Whalton and his men went ashore to find themselves ambushed by the natives who were armed with muskets. Whalton and another crewman were killed immediately and the others ran for the tender and rowed for their lives back to the ship. 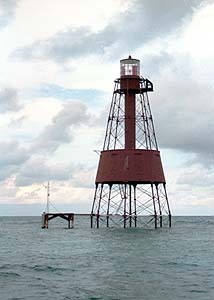 The floating lighthouse, the Florida, served until 1852 when it was replaced by the present day Carysfort Reef Lighthouse.